A few days ago I promised you a Turkish post, but I’ve got something better. Ever since I wrote about Peter’s Greek Christmas Cookies I’ve been thinking, rather remembering, more about what this blog means to me. Blog existentialism, if you will; Olive Juice was born out of necessity. I needed a place to jot down and compile my recipes, experiences and, most importantly, the memories that would inextricably become a part of those experiences. A mathematician by day, I realized that I can use a blog to pursue what genuinely inspired me: food, something that a lot of friends and family thought was a silly crush that would soon fade away. Seven years later, the passion is still here, and admittedly, stronger than ever. As I write this I’m eager to share with you more about the other aspects of food that make me giddy, but that will have to wait for another post. Today, as promised, is going to be about Turkey and the traditional pudding called Muhallebi that I chose for my inaugural Turkish entry. The detail that makes this pudding better than simply ordinary, besides its ease and wonderful flavor, is its history. When I first read on Wikipedia that Muhallebi was Turkish, I became curious. Not because it was Turkish in particular, but because Muhallabi, rather محلبية (pronounced Mahlabiye), was a dessert I had always considered as Middle Eastern – a childhood favorite, in fact. It was the pudding I could never get enough of. The pudding that would make me (voluntarily) set the dinner table only to reach dessert mere minutes sooner. The pudding I knew I had to blog about. Upon reading that the pudding was originally Turkish, the skeptic in me also wanted further proof of the fact. A few Google searches later landed me on Warda’s blog, 64 sq ft kitchen, where she writes about Muhallebi as a staple Algerian/Moroccan pudding also reminiscent of her childhood. A pudding that her grandmother would quietly, but often predictably, put together in a matter of minutes. The ultimate indicator being the unmistakable fragrance of the orange blossom water that carried through from the kitchen. It was stories like these that made me fall in love with this pudding all over again. In a small saucepan, whisk together milk, rice flour and sugar until dissolved. 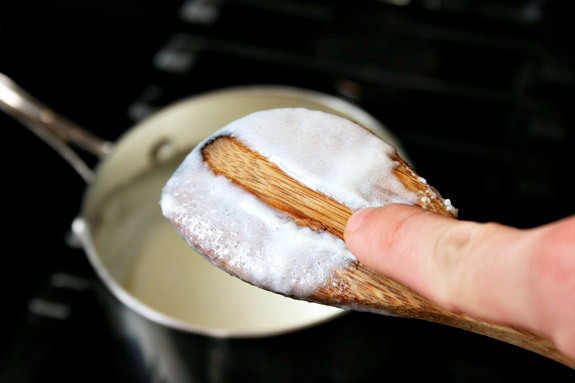 Stir with a wooden spoon over medium heat until it reaches a boil. Continue stirring over medium-low heat until you can coat the back of your spoon (when you can make a line with your finger without the liquid coming together, you’re set). I didn’t time it, but Warda says this takes about 15 minutes total. 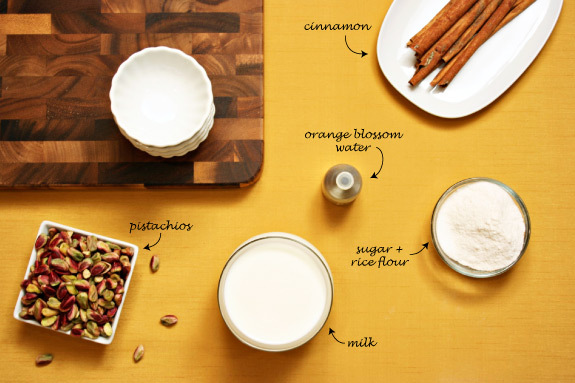 Once the spoon test clears, you’ll want to turn off the heat and add a few drops of the orange blossom water. Pour the thickened pudding into ramekins, cover with plastic wrap and refrigerate until you’re ready to serve. 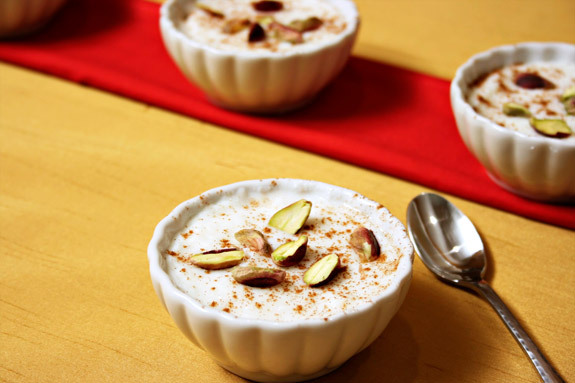 A light dusting of ground cinnamon and a sprinkling of chopped nuts is traditional. I used pistachios, but almonds are also popular (I’ve even seen both used together). The pudding is a mix between a velvety custard and a rice pudding, but with a little more to offer. The subtle fragrance of the orange blossom water is present, but not prominent. After just 15 minutes in the kitchen you can leave with piece of mind, knowing that dessert is already covered. It’s this dish that will leave your guests smiling, and remind you why you fell in love with food in the first place. In a small saucepan whisk together milk, sugar, rice flour and salt until dissolved. Stir with a wooden spoon over medium heat until mixture comes to a simmer. Continue stirring over medium-low heat until you can coat the back of your spoon (when you can make a line with your finger without the liquid coming together, you’re set). Remove from heat and add the orange blossom water. Pour into ramekins, cover with plastic wrap and refrigerate until ready to serve. Dust with cinnamon and sprinkle with almonds and/or pistachios for garnish. note: You can find orange blossom water at Whole Foods or any Middle Eastern market. Posted in desserts, Middle Eastern, North African, recipe, Turkish by Antonio Tahhan on November 19th, 2008. You can follow any responses to this entry through the RSS 2.0 feed. You can leave a response, or trackback from your own site. Thanks, Tony! I’ve been looking for recipes to use up all the rice flour I have, so this will definitely be one of them. This looks so good Tony! Wow! So decadent and velvety…I have all the ingredients here so I will def give this a try. Unique ramekins you have there! oh you are bad Tony! I used to so enjoy bowls of these when living in Doha! Those pistachios are calling my name!! Dates back to the Ottaman Empire? Well, I guess that’s just another reason to try it. If thousands of years can’t prove it wrong, then we can’t either 🙂 Nice job big Tony, it looks easy and delicious. This looks yummy. Perhaps if I can find some rice flour I’ll try it. I am so making this! Sounds and looks great, esp. with pistachios! Great photos too! marry me, for this! great stuff here! Tony, this pudding does sound like a wonderful dessert and I appreciate the homework you did on the the origins of the dessert. Thanks again for the link-action and hope you didn’t gorge yourself on them! This looks marvellous! I remember having something like this (or perhaps it was this very dessert) when I visited Egypt a couple of years ago…yummy! Those look delicious, and your explanations are so clear! I am bookmarking this! i’m surprised & not so surprised that it is originally turkish. for me, i think muhallabieh and i think syria (bc that is where i first tasted it), but it turns out that a lot of typical M.Eastern or “Lebanese” foods are all from the culinary mother- Turkey. A lot comes from there, and it makes me want to pick up a book and read about the food history of that country. p.s: don’t you put mastik in this? in my family we do! Thank you for the info about this pudding. And from your description and your fond memories, it indeed is more than the sum of its parts. Just lovely, Tony. This looks just like a fabulous sephardic recipe that I grew up with called “sutlouch.” It was one of the few great things that my mom made, but, boy, was it great. Thanks for the reminder. I’m so going to make your version after Thanksgiving. Wow that sounds so luxurious! This sounds amazing. I love rice pudding and the other flavors sound delicious with it! oooo! I didn’t know what to do with my bottle of orange blossom water. Im gonna try this. You´re an artist in the kitchen. Congratulations. Yay! you made my day with this! so what do you know about kazan dibi? specifically all the recipes i see say bake for 15-20 min at moderate heat… what’s moderate? Hi Barbara! Thanks for the comment. I’m sorry I don’t know much about kazan dibi… I have a Turkish friend in Aleppo that I could ask on Monday, if you’d like. I would guess though that moderate means somewhere around 350 degrees. I hope this helps. Great recipe, just to clarify something though, orange blossom water is not used in Turkey, furthermore most people in Turkey haven’t even heard of it. 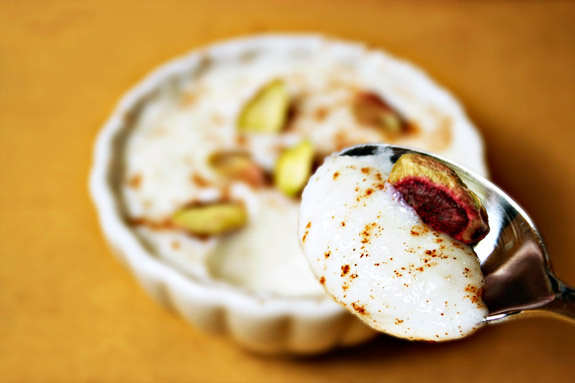 We mostly use rose water in some desserts, but our muhallebi only asks for vanilla and cinnamon. Muhallebi is most common in Turkei. If you add the rice name is sütlaç..But I like muhallebi..